GREAT FALLS — Football practice began Friday for the Class AA schools as players from both C.M. Russell High and Great Falls High took to the practice field for two-a-days. Rules prohibit contact for the first three days of practice, meaning Tuesday is the first day contact is allowed. About 100 players are out in grades 10-12 for the Bison, which is up a bit from last season. The Bison lost some experience on the offensive line, but have some experience back, Krahe said. Krahe hasn’t settled on a quarterback, but said Kolby Sukut and Colter Posey are battling it out to see who will be the starter. The Bison are looking to improve on last season’s 3-7 mark as Krahe embarks on his third season. “It takes some time to implement what you want and get everybody on the same page and all that,” Krahe said. MEANWHILE, With the football spiraling through the air, senior Josh Horner ran his route down the left seem of the practice field at Charles M. Russell High on Friday afternoon. He stretched for the ball, batting it up twice before diving to secure it. Onlooking teammates erupted in applause. It signaled the opening — and enthusiasm — of prep football. “It’s great to be back out here,” said head coach Jack Johnson, who enters his 40th year at the helm of CMR football. About 150 kids took to the practice football Friday for the first day of organized team practice. 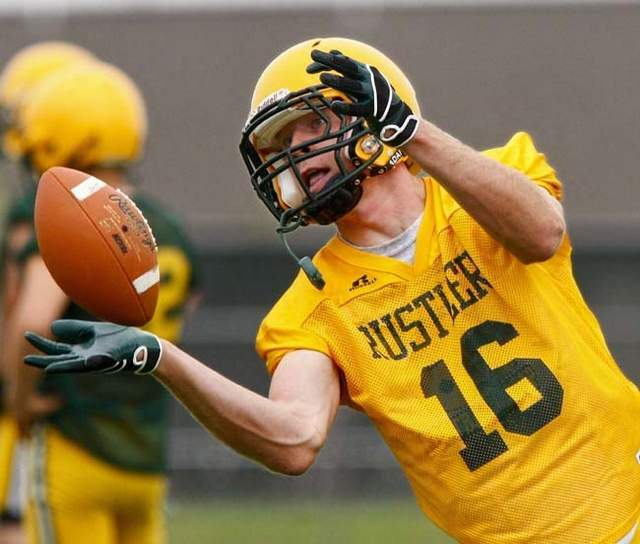 The Rustlers will hold their first intersquad scrimmage on Saturday, Aug. 18 at Memorial Stadium. The freshmen will compete at 6 p.m. while the sophomores match up at 6:45. The varsity will clash at 7:30. CMR, which earned a playoff berth and finished 5-6 last fall, will open the season on the road against Butte on Friday, Aug. 24.